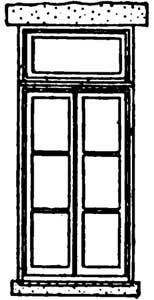 Next to the double hung window, in regard to general use in the old house, comes the casement window or French window. This window has the sashes divided vertically, each being hinged at the sides like a pair of doors. 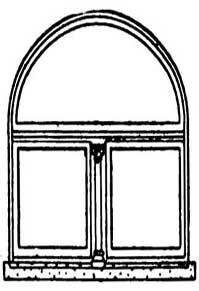 Transoms were frequently, although not necessarily, used with this style of window. 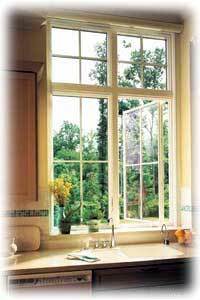 Windows in which the sashes are hinged at the sides, to swing in or out like a door, are called casement windows. When the windows are 6 or 7 feet high and the sashes are divided into two folds, the sill coming nearly to the floor, they are frequently termed "French windows." The casement window is the common type of window in Europe, but it had serious objections which made it undesirable for general use. The most important of these objections is that if the sashes swing in, it is difficult to make them storm proof, and also that casement windows interfered with the shades and draperies. 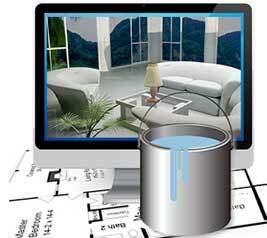 On the other hand, if the casement window swings out, fly-screens could not be used on the windows. The construction of a casement window frame is very much like that of a door frame, the difference being in the arrangement of the wood sill and in the rebate for the sashes. If it is desired to swing the sashes back against the walls, the edge of the frame must be kept out nearly flush with the face of the wall. The strip of board on the back of the frame is nailed to it for the purpose of holding it more securely in place, and it may be put on in short. It is very difficult, and in fact almost impossible, to construct a casement window so that the rain cannot beat in, unless the sashes are hung to swing out; and if the sashes open outward it is impracticable to use outside fly-screens. Casement window frames and sashes should be at least 1/4 inches thick and when in brick or stone walls should be well secured to the masonry. When casement windows are less than 5 feet high, and more than 3 feet wide, it is better construction to have a narrow mullion between the sashes than to have the sashes rebated together. Besides these styles of casement windows, there are others in which the sashes are pivoted, either at the center of the sides, or at the top and bottom. 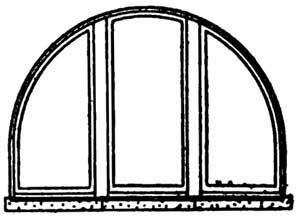 Windows of the shape shown below are frequently seen in large buildings. The sashes in these windows, if they opened at all, were usually pivoted at the top and bottom.